Explanation: There's even a California in space. Drifting through the Orion Arm of the spiral Milky Way Galaxy, this cosmic cloud by chance echoes the outline of California on the west coast of the United States. Our own Sun also lies within the Milky Way's Orion Arm, only about 1,500 light-years from the California Nebula. Also known as NGC 1499, the classic emission nebula is around 100 light-years long. 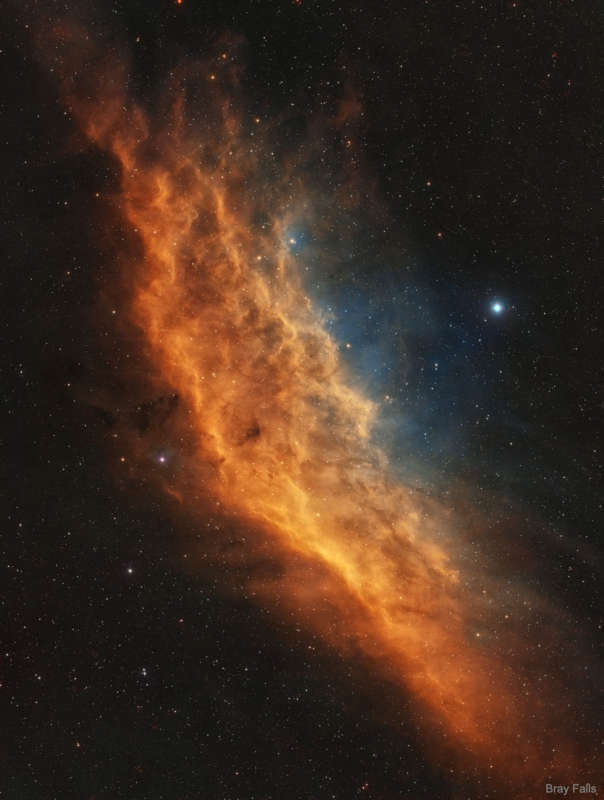 On the featured image, the most prominent glow of the California Nebula is the red light characteristic of hydrogen atoms recombining with long lost electrons, stripped away (ionized) by energetic starlight. The star most likely providing the energetic starlight that ionizes much of the nebular gas is the bright, hot, bluish Xi Persei just to the right of the nebula. A regular target for astrophotographers, the California Nebula can be spotted with a wide-field telescope under a dark sky toward the constellation of Perseus, not far from the Pleiades.